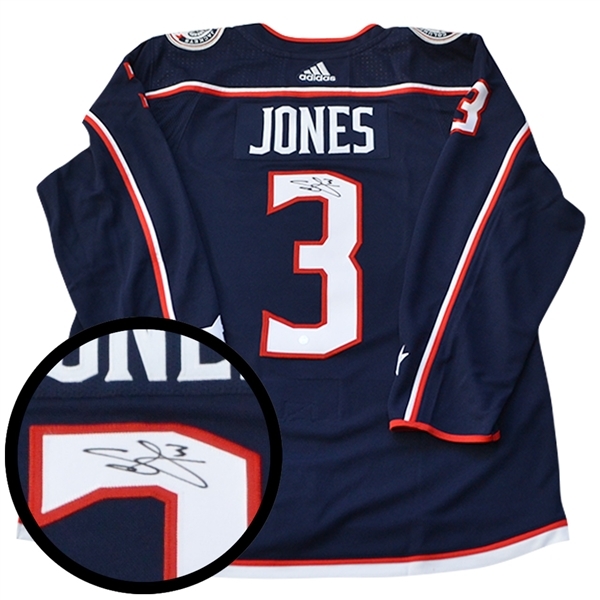 This ADIZERO Authentic Columbus Blue Jackets Pro Adidas home jersey comes personally autographed by Blue Jackets defenseman Seth Jones. This jersey features new cresting materials and construction technology. The ADIZERO Authentic NHL jersey also has the Adidas Clima® technology in each of the jersey fabrics to deliver breathability and enhanced performance. Built stronger and constructed for durability, the ADIZERO Authentic NHL jersey fabrics are up to 27% stronger in burst testing and up to 72% tougher in abrasion testing. Jones’ NHL career started when he was drafted fourth overall in 2013 by the Nashville Predators. After spending three years in Nashville he was then traded to the Columbus Blue Jackets in exchange for Ryan Johansen. Seth Jones is currently attending his third straight NHL All-Star appearance following a breakout season during the 2017-2018 NHL season. Jones recorded 16 goals and 41 assists for a total of 57 points, a career high for Jones. Seth Jones is certainly on pace on becoming an elite All-Star defenseman. Currently Seth Jones is on pace for another 50 point season. Earn yourself a piece of an All-Star by bidding on this Pro jersey. This jersey is perfect for any Blue Jackets fan or hockey fan. It comes complete with a Frameworth hologram and COA to ensure the authenticity of the signature. We do not guarantee any specific jersey sizes but we typically carry sizes L, XL or 52, 54 & 56 for Pro jerseys. These sizes are considered the most ideal for framing & displaying.